Here is my weekly cake post. I know you love them! 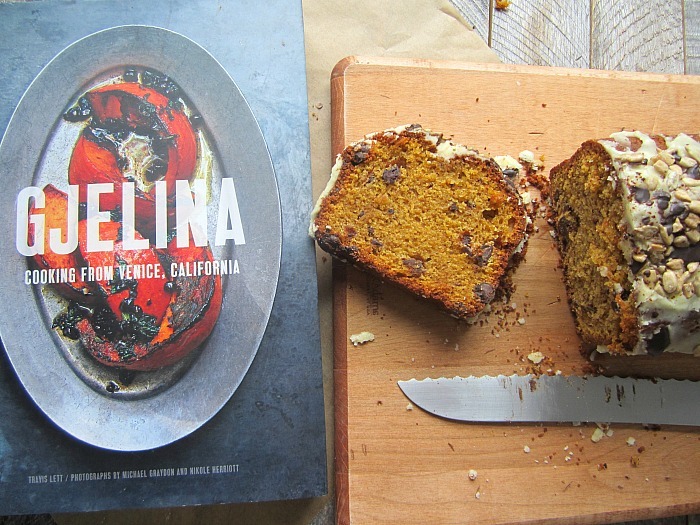 A rumor was going around town that the hottest L.A. restaurant, Gjelina was opening an outpost in NYC. Boy, was I excited......only to have my hopes shot down by an article that read the landlord and investors were not getting along, so they squashed the deal. Oh well....I am not going to Los Angeles anytime soon, so I will just have to keep making the wonderful recipes from the Gjelina cookbook. 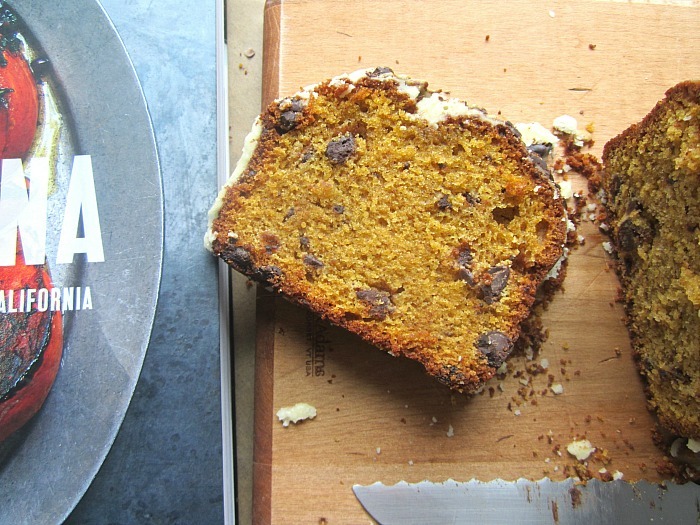 So in honor of the "squashed" deal, I made this squash cake. (Hilarious). I have had this recipe bookmarked for 2 years, so it was due. Kabocha squash is a super sweet squash.....if you can't find it, then I suggest you substitute canned pumpkin or sweet potato, but feel free to experiment. You can always use butternut squash. 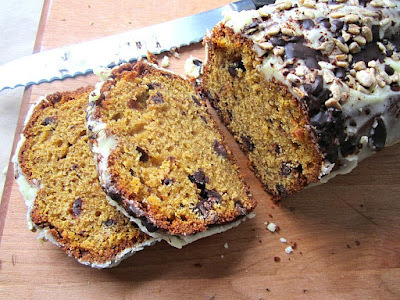 I have had excellent results using butternut squash in baked goods. And a note regarding the olive oil. You know I am a pro when it comes to baking olive oil cakes. You MUST use a mild flavored one. I swear by Colavita extra virgin, and I am not getting compensated by them in any way. And please, don't skip the glaze, it is very rich and luscious, like a butter frosting. I used toasted sunflower seeds for the top, cause I didn't have pepitas (pumpkin seeds). 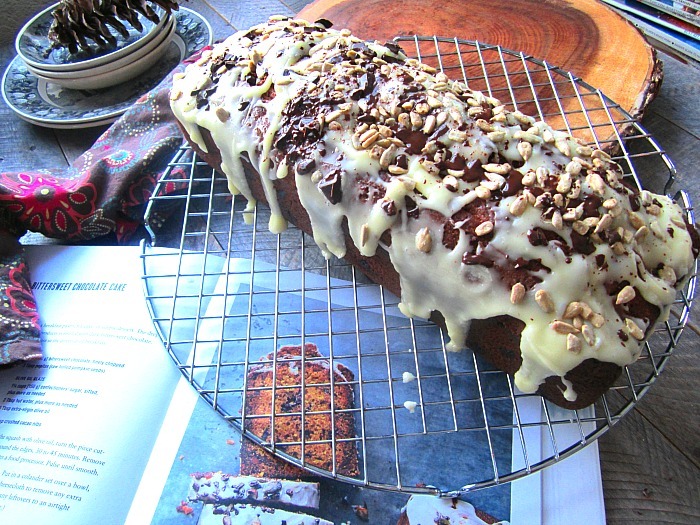 This yields a BIG, gorgeous, moist loaf cake and smells divine while baking. I was a bit scared of the 2 tsp of nutmeg, so if you are not a fan, then reduce to 1 teaspoon, but I promise, it is fine. I reduced the sugar just a bit too, and it was plenty sweet. I am posting the ORIGINAL recipe from the book, so feel free to use the tips I have given you. Cut the squash in half, and remove the seeds. Drizzle w/ olive oil and kosher salt and roast flesh side down on a parchment lined baking sheet. 425F for 25-35 minutes. Scoop out the flesh and let cool. 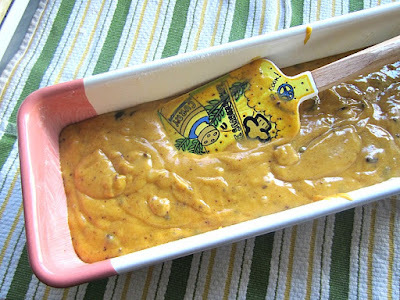 You can do this days in advance and keep the squash puree in the fridge (or freezer). Preheat the oven to 325˚F, and generously butter a 9x5-inch loaf pan. This makes a large loaf cake, so if you have a bigger loaf pan, that is fine too. Sift together the flour, baking powder, baking soda, cinnamon, nutmeg, and salt in a medium bowl. In a large bowl, whisk together the sugar, olive oil, squash or pumpkin purée, and eggs. Add the dry ingredients to the bowl with the wet ingredients and whisk until just combined. Fold in the chopped chocolate. Pour the batter into the prepared pan and bake for 75 to 90 minutes, or until a skewer inserted in the center of the cake comes out clean. Mine needed only 70 minutes because I cooked it in a longer pan. Let the cake cool in its pan on a wire rack for 15 minutes. 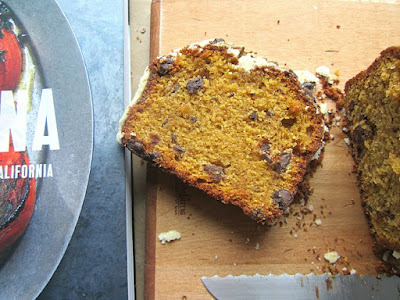 Run an icing spatula or a thin knife carefully around the edges, and invert the cake from the pan. Re-invert the cake so that it is right-side-up and let cool on the rack for another 20 minutes. In a small bowl, whisk the confectioner's sugar with the water until smooth. Add more sugar and/or water until you have a glaze that is the consistency of honey. Slowly drizzle in the olive oil, whisking constantly to combine. Pour the glaze over the cake, allowing it to drip down the sides. Sprinkle with the pepitas and cacao nibs and let the glaze set completely (about 1 hour) before serving. This cake lasts all week. Stays nice and moist and is great for breakfast. It gets better the second day, and even better the third! What a beautiful cake! The first time I went to Gjelina we just wandered in without a reservation, sent by a barista who recommended it. We had no idea it was the in spot! The staff is so sweet--no pretentiousness. After we left, my daughter pointed out that we were sitting next to some actor I should have recognized:) The food is wonderful! Been waiting for this. I know it's divine! Thanks! I can't wait to make this again. It got better each day. We loved a slice with coffee. I needed a recipe I could make and freeze to bring to a Super Bowl party. This is it. Thanks. Can this be made as mini loaves or as muffins?